As Hugo Chavez’s death was announced on Tuesday, Saturday Night Live wasted no time mocking the Venezuelan leader’s time in power during the show’s opening sketch this week. Featuring Justin Timberlake imitating Elton John, SNL skit took place at a memorial for Hugo Chavez, who died on Tuesday at the age of 58 after a long battle with cancer. Justin Timberlake was singing an updated version of Elton John’s classic song Candle in the Wind in tribute to Hugo Chavez and some of the crazy, real-life, aspects from his 14 years in power. Another hilarious line from the song was: “You said the U.S. causes earthquakes and you outlawed Coke Zero. “And on your shoulder sat your parrot with a matching red beret. “You had your own T.V. show, it was called <<Hello, President>>. “It wasn’t about politics, you sometimes danced and made up raps. 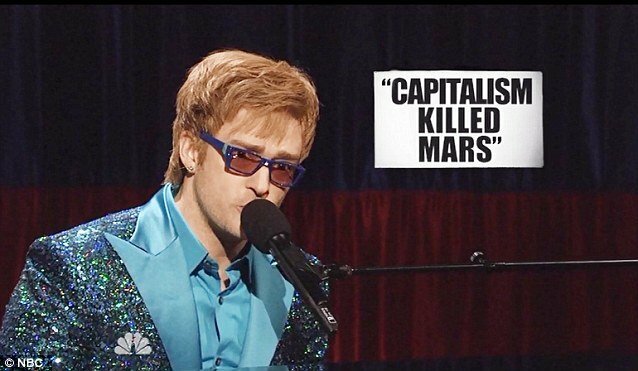 Justin Timberlake also included Hugo Chavez statement that “Capitalism killed Mars” when the Socialist firebrand said that a society had taken root on the planet but capitalism had wiped out its water supply. Justin Timberlake was also the show’s musical act. The episode featured an unusual amount of guests stars including Tom Hanks, Steve Martin, Chevy Chase, Dan Aykroyd and Andy Samberg.